In the days leading up to the Iraq War, Jacques Chirac strained French relations with the new democracies of Eastern Europe by condescendingly declaring they “missed a golden opportunity to shut up.” After the fall of Saddam Hussein, several French officials, such as the former UN ambassador Jean-Bernard Mérimée were implicated in the Oil-for-Food scandal. However, no such troubling details will intrude on the self-aggrandizement of France’s political class in The French Minister (trailer here), a rare misfire from Bertrand Tavernier that opens this Friday at the IFC Center. Technically, Alexandre Taillard de Worms is a “conservative,” but his contempt for America is so great, he has no problem hiring a young lefty like Arthur Vlaminck to be his new speech-writer. It is hard to write for the eccentric minister, but a couple of quotes from Heraclitus usually placates him. Essentially, the Taillard doctrine boils down to this: French intervention in its former African colonies is good, but American intervention in the thinly fictionalized Lousdemistan is bad. While Taillard often acts like a pompous buffoon, especially during a lunch with an American Nobel Prize winning novelist (supposedly based on a real life incident still remembered in hushed tones around the Quai d’Orsay), French Minister has all the satirical bite of a retirement roast. That old Taillard might be nuts Tavernier and his co-writers Antonin Baudry and Christophe Blain tell us, but he is crazy like a fox. As for any soul searching regarding French colonialism, Oil-for-Food, or France’s grand ambition to subordinate EU policy making to its own ends, do not hold your breath. Even if you agree with the film’s extreme Chirackian-Gallic perspective, it is still difficult to watch Thierry Lhermitte’s ridiculously over the top turn as Taillard. You will see less shtick in an average Pauly Shore film. On the other hand, Raphaël Personnaz’s vanilla Vlaminck does nothing more than applaud his boss’s dramatic outbursts like a trained seal. The only measure of redemption comes from the unflaggingly reliable Niels Arestrup, who plays veteran civil servant Claude Maupas like a sly, understated cousin to Nigel Hawthorne’s Sir Humphrey in Yes Minister. Bertrand Tavernier has made some great films, including one of the all time great jazz movies, Round Midnight, as well as the elegantly tragic historical, The Princess of Montpensier. This is not anywhere close to their league. 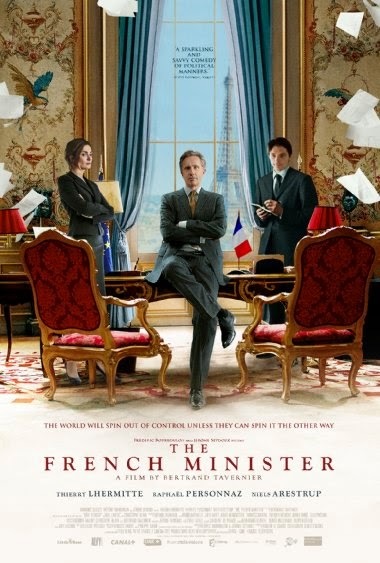 Frankly, Pierre Schöller’s similarly titled The Minster brings far more wit and insight to bear on French politics, but frustratingly, it has yet to find an American distributor. Smugly self-satisfied and self-congratulatory, The French Minister desperately wants to soak up the adulation it hasn’t earned. Not recommended, it opens this Friday (3/21) in New York at the IFC Center.